What will be in the book sale? Books withdrawn from the library’s collections; gift books deemed not needed to be added to the collections. Items other than books are sometimes available such as records, VHS, etc. How is the book sale organized? Tables for different subject areas. Building Pathways to Empowerment: A Regional Forum on a new course of action for programs and services for people with developmental disabilities and their families is free and open to the public. Sponsored by ARC of Vigo County, the Cunningham Memorial Library and The Arc of Indiana. The African Student Union (ASU) in conjunction with the International Student Organization (ISO) will be hosting a series of Conferences called the Unity Conference. The first of these series is titled “Maintaining Identity within Diaspora“. It is open to the general public and will focus on issues concerning the interactions between African students and the American society. Special emphasis will be placed on issues related to diversity. The goal is to bridge the gap between international students and domestic students whilst helping to amend some of the conflicts that may be present amongst various international groups. It will be hosted in the Library Events Area on Thursday, Feb. 24 from 5 to 7:30 p.m.
February 23: Authors and Artists Event coming tomorrow! Don’t forget to join in the celebration of the written word, art and musical performance! 4pm Wednesday, Library Events Area – search the blog for earlier post with list of honorees. Reception, program, reception – ie food, fun, and faculty! Reception begins at 4pm, with program at 4:30, keynote: Dr. John Murray, Dean, College of Arts and Sciences. The only campus event that honors the written or artistic material or performance of ISU’s faculty, staff and students, this year’s 26th annual event will feature 20 ISU faculty and emeriti who published or created artistic works in 2010. The occasion also serves as a place to recognize this year’s Graduate and Undergraduate recipients of the Library’s Bakerman Research Award. The winner of the Reel Big Video contest will be announced as well. 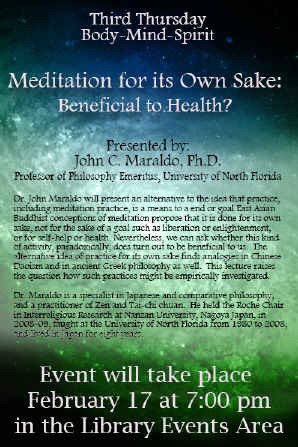 February 17 in Events: Meditation for Its Own Sake: Beneficial to Health? Meditation for Its Own Sake: Beneficial to Health? 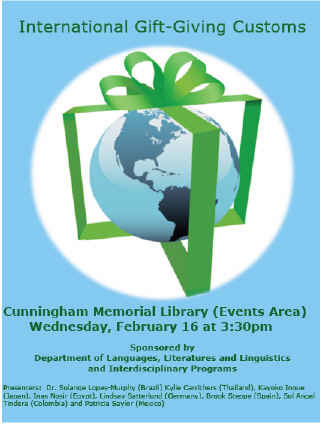 February 16 in Events: International Gift Giving Customs! Public lecture hosted by the Vigo County, Indiana, War of 1812 Bicentennial Committee, in cooperation with the National Park Service. This lecture is free and morning refreshments will be provided. Moderator is David A. Nichols, ISU. 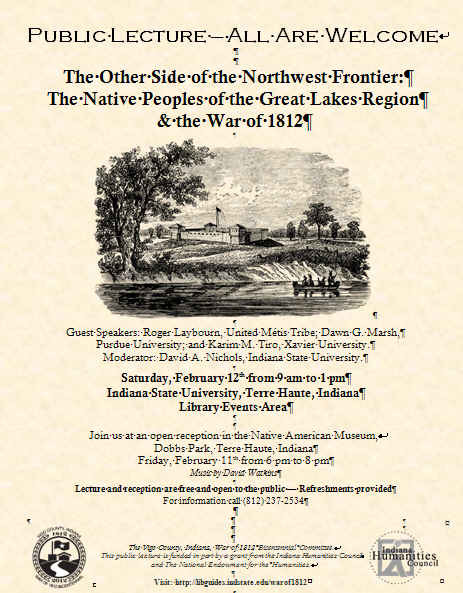 In addition, on Friday evening, February 11, a free reception will be held at Terre Haute’s Native American Museum in Dobbs Park, from 6 p.m. to 8 p.m. This night will offer an opportunity to informally chat and socialize with the speakers. Dr. David Watkins will provide the music, and The Crossroads Café will provide refreshments.